Hailed as a child prodigy, Jean Varda’s talent transported him from his home country of Greece to the center of modernism in Paris to a permanent home along the Central California coast. As lively and colorful as his artwork, Varda’s charismatic personality attracted the leading artists and intellectuals of the day—from Pablo Picasso and Georges Braque to Henry Miller and Anaïs Nin. 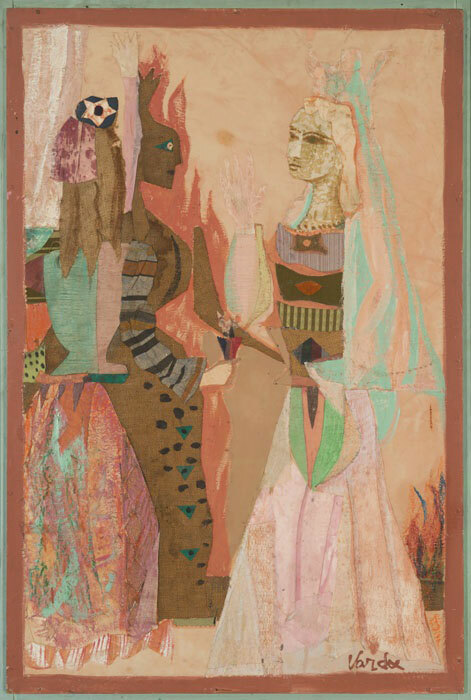 Known for “using everything but the kitchen-stove,” Varda incorporated various found textiles and other materials into his mosaics and collages depicting beautiful women and exotic cityscapes. Born in Smyrna, Greece, “Yanko” Varda made his mark by painting portraits of socialites in Athens. As with many artists of the period, Varda traveled to the capital of the art world, Paris, and enrolled at the École des Beaux-Arts. While there, he fraternized with notable twentieth-century artists, including Picasso. The Spaniard’s criticism of his art as too academic led Varda to question his ability and drop out of school. Varda subsequently moved to England in 1914, married his first wife, and reinvented himself as a ballet dancer. In time, however, the undeniable lure of painting and dissolution of his marriage prompted Varda to return to Paris. He immersed himself in the vibrant cultural milieu and embraced the avant-garde art movements of Dadaism, Surrealism, and Cubism. From 1929 until 1939, Varda split his time between London and the Mediterranean town of Cassis where he lived with his friend and fellow artist, Roland Penrose. During this decade, Varda began to experiment with found materials, incorporating them into “Byzantine-Cubist” glass mosaics that often featured spiritual iconography as well as elements rooted in Greek mythology. By 1939, Varda was exhibiting these unique mosaics to critical acclaim, and he traveled to New York for a show at the Neumann-Willard Gallery. American critics were puzzled by Varda’s innovations: “These pictures, or most of them, could not in the strict sense be called paintings; neither are they, exactly, mosaics.” During a trip to San Francisco, he traveled to Big Sur—a then-rural region that reminded him of Greece and inspired him to settle in the United States. The year 1946 was a watershed for Varda: he welcomed the birth of his daughter, Vagadu, and received an invitation to join the faculty of Black Mountain College’s popular summer institute. Working alongside renowned artists such as Jacob Lawrence and Leo Amino, Varda taught painting and composition with an emphasis on collage. An experimental college located in the Blue Ridge Mountains of North Carolina, Black Mountain’s interdisciplinary pedagogical approach encouraged material explorations, a philosophy that complemented Varda's own adherence to mixed media. Known for his eccentric and bohemian nature, Varda and his courses attracted numerous students, including Ruth Asawa, whom he encouraged to relinquish rigid geometry. Returning to the California coast, Varda purchased an old ferryboat, the Vallejo, which he renovated into a houseboat and relocated to the Sausalito waterfront with his third wife. The ship became a floating art salon, and invitations to his legendary costume parties on the Vallejo were highly coveted. Throughout the 1940s and 1950s, Varda sporadically taught at local colleges in California and continued to exhibit his collages, including mosaic designs for California’s Union City BART station. Major museums, such as San Francisco Museum of Modern Art and the Smithsonian American Art Museum, include Varda’s work among their collection holdings.